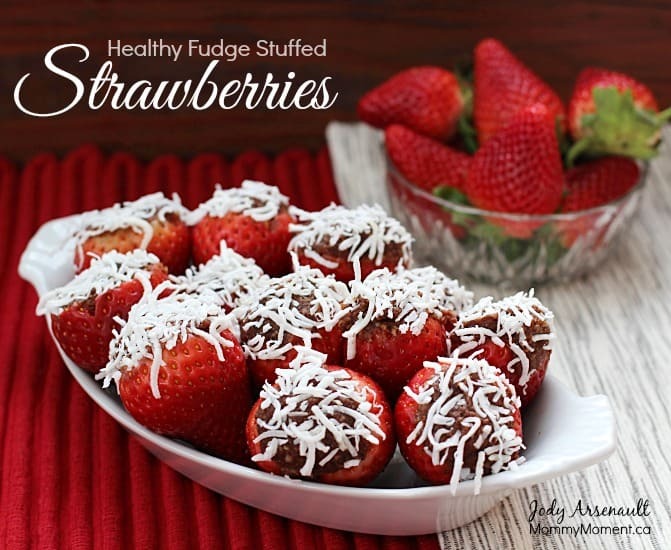 Healthy Fudge Stuffed Strawberries – Oh my, these stuffed strawberries are a little taste of heaven. With only 6 ingredients and no refined sugar, these are a scrumptious treat. These healthy fudge stuffed strawberries have only 6 ingredients and are free of refined sugar – a sweet and healthy little treat! Blend together the dates, almond flour, cocao and water. Hull out the strawberries and fill them with the “fudge” mixture. Dip in coconut if desired. If you are looking for healthy recipes that satisfy that chocolate craving, this recipe is a must try for you. I warn you, these little strawberries are quite addicting! I absolutely love strawberries – I love that this is a quick, healthy and raw recipe that can be made in a hurry! Strawberries can also be used to decorate a beautiful “fruit” cake and of course when you are talking about strawberries, you can’t forget about that well loved children’s character Strawberry Shortcake which also makes a beautiful cake. Did you make something special for National Strawberry Day? 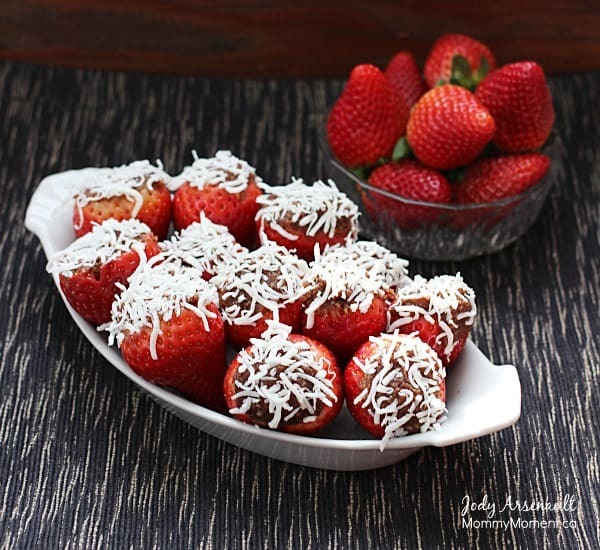 Some other strawberries recipes you may enjoy, easy 5 minute strawberry butter, strawberry sugar cookie parfaits, strawberry no bake cheesecake, strawberry cream chocolate cake ganache topping, strawberry petite scones, strawberry sugared mini donuts. Delish! Think you could use regular flour instead of almond? Tammy, I really think it has to be a ground nut of some type which I understand is not ideal for families with allergies. I tried to search online for a suitable substitution, but I could not find one that I thought would work. If you do try it with regular flour, let me know how it turns out, I think you may want to use a little less than the almond flour. Thanks Angie – These are a great treat. My aunt popped by when I made them and she could not get enough of them either. Almost too pretty to eat! They sound delicious. I’ve shared this recipe with my mom. Thanks Stacie! They are such a nice treat, especially because my hubby and I are not eating refined sugar now. I’m sure these will be a new favorite for us. Try putting the filling in a ziplock bag and snipping off a corner similar to a piping bag. Should be easier to fill the strawberries- way less mess! These look awesome ! I am definitely going to try making them ! What an attractive dish! I saved the recipe thank you. Thank you for sharing this lovely menu! I can’t wait to try this out. I love strawberries! This sounds amazing, I can’t wait to try it. Do u need to mix it in a blender? And us it cocoa or a different kind of powder? Ok perfect thank you. I will try in a blender or food processor. Where can I find cacao powder, cause me too am very healthy?? those look amazing! I think I’ll be giving them a try later since I picked up a bunch of strawberries yesterday and they are HUGE…perfect for stuffing. I wonder if it’s too much if I also dipped them in chocolate after they are stuffed? I bet they would be delicious dipped in chocolate. These look fantastic! I can just imagine how lovely they’d taste. Chocolate and strawberry go together so well. Theses look so good wish I could eat a few now thanks for sharing the recipe! These look so good Jody! I’m loving your recipes with dates in them!! Jo-Anna, I love using dates in recipes! Yum, these look so delicious! What a great combination of ingredients! Oh wow, these look so delicious. I’m happy to see that they would be easy to whip up if you just happen to get unexpected company. the image also looks so beautiful. Thank-you! They are so easy to make in a hurry! These look so delicious and it’s great that they’re healthy too. Can’t wait to try this out for myself! 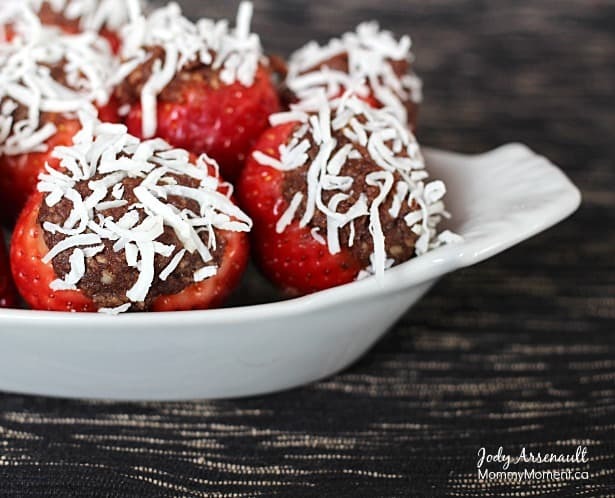 These Healthy fudge-stuffed strawberries sound so good that I will have to try them. My husband loves dates and I know we will both enjoy them. Oh my my my does this look so delicious! I have a weakness for chocolate & strawberries they are so good. Mmmmmm, strawberries, what a great fun snack!